I visited Kenya for the first time in 2007 as part of a life long dream to overland Africa from South to North. 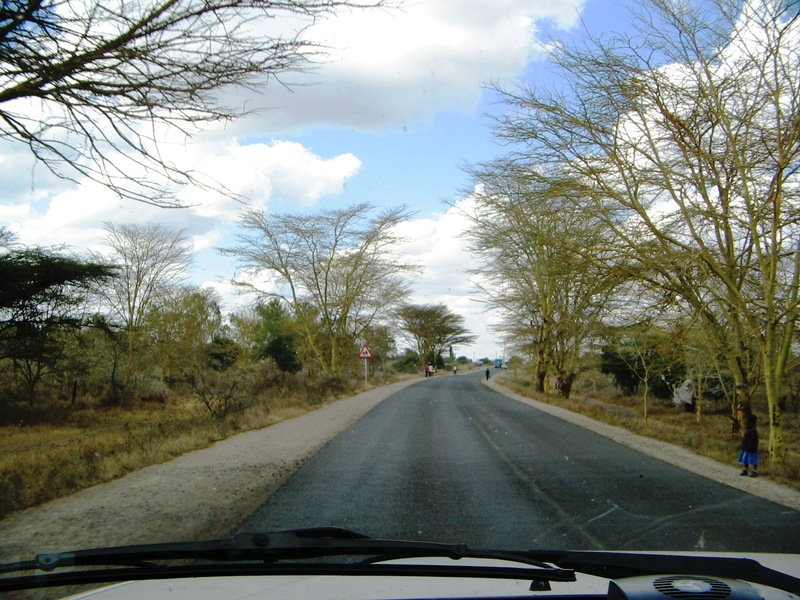 We entered through Namanga border post in the South and the whole process on both sides took us a mere 30 minutes – not bad for Africa! 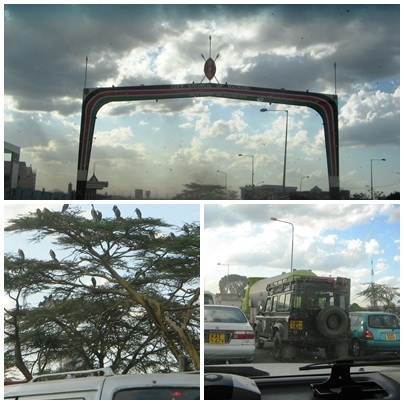 My first introduction to Nairobi was, to say the least, very interesting. 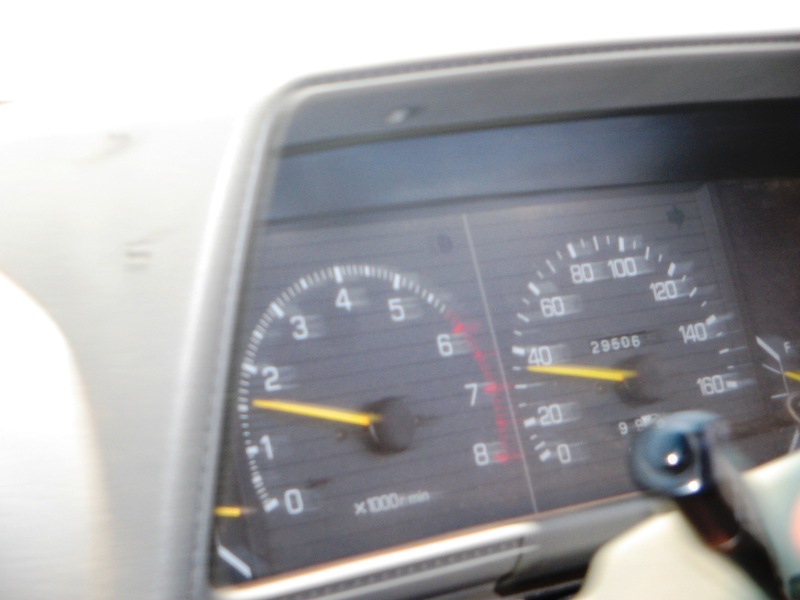 The bumper to bumper traffic is nerve wrecking, but my Better Half was not intimidated at all by this as he is used to driving in Khartoum, where he worked, with even worse traffic. Thumbs up to him! You really have to have nerves of steel and adapt or die to cope with the aggressive African drive style, but our trustworthy Garmin GPS took us all the way to Upper Hill campsite in the middle of Nairobi without any glitches. As I had a “fly in” visa for Sudan (which was pre-arranged before we left home) we set off to the Sudan embassy to change it to a “land” visa as this was one of the last opportunities before entering Sudan. Arriving at the embassy we are enlightened that the embassy only deals with visas on Tuesdays and Thursdays. Today is Friday!! Bummer. 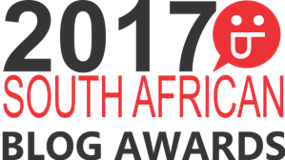 This means I cannot drive all the way with hubby in the bakkie to Sudan. Plan B needs to kick in now. So we decide to get to Addis Ababa and then we will have to make the final decision about the Sudan visa. For the rest of the day we were on the road and arrived after dark at Mountain Rock Lodge just outside of Nanyuki . 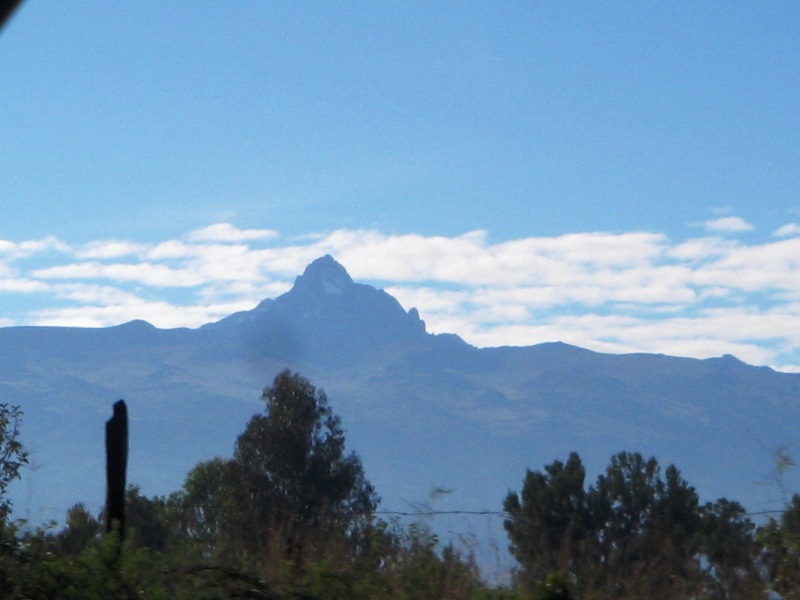 That night at an altitude of 6 420 ft we have our last beer (aptly named White Cap) in the Southern hemisphere in the foothills of Mount Kenya and sleep like logs near the equator (S00.06.687, E37.02.464). Tomorrow will be a big day as we will cross over into the Northern hemisphere. 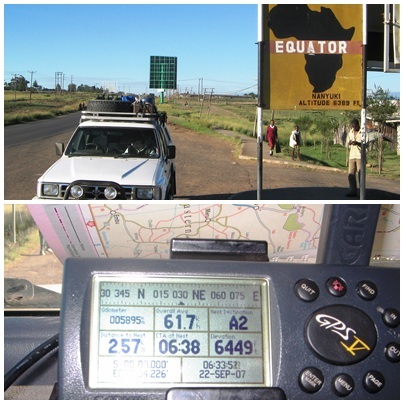 Proof that we are on the equator in Kenya! On 22.11.2007 at a height of 6 495 ft and 5 895 km from our home in George I can remove the tag from by travel bucket when we cross the equator. We pass big commercial farms and get our first glimpse of Mount Kenya with its ice cap. 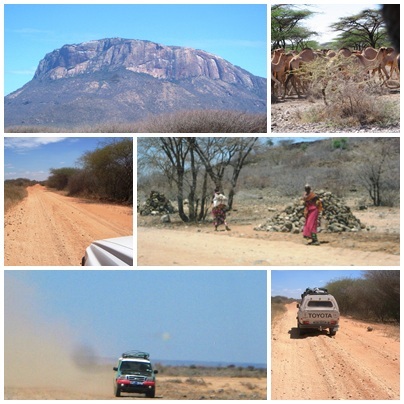 At Isiola we fill up everything with fuel and water before we set out on the infamous road to Marsabit. Our trusty Hilux was taking a beating on this stretch. At the 12 km mark we had our first “incident” when we lost a spot light, at 44 km we lost our rear back shock due to the horrendous road conditions, at 116 km the gas bottle holder on the roofrack breaks and at 206 km the roofrack finally breaks. We still have quite a bit of road ahead of us. The “incident” list is getting longer and longer as the driver’s safety belt gets stuck in one position, I loose the glass on my watch and we almost have no breaks on the Hilux. After driving 7.5 hours to cover the 250 km we arrive tired in the dustbowl town of Marsabit. 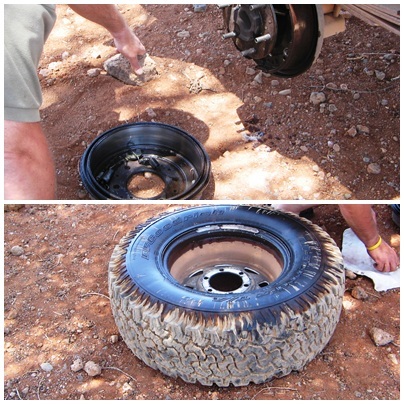 Just a few quick but necessary repairs before we go to bed in a howling wind. Tomorrow will be another long hot day when crossing the Kaisut desert as we also need to be on the lookout for bandits before we reach Moyale on the Ethiopian border. We buy fresh bread from the bakery run by a Swiss guy who has been living in Marsabit for the past 30 years (I can think of a lot of other places I would rather stay!) before we take on another hot day in Africa. The Kaisut Desert is waiting. At the police post at Sololo we were told to take four policemen as escorts to Moyale as we are not traveling in a convey through bandit country. After much negotiation, and just because there is no space, we are allowed to squeeze in only two guards. I end up on the backseat with a lot of stuff on my lap and hubby and the two guards, with AK47’s, sharing one seat in the front. It is going to be a long hot and sweaty 130 km to Moyale! 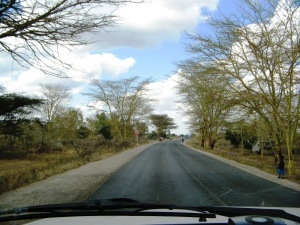 After 8 hours and only covering 250 km we reached the dusty border town of Moyale – and did not see one bandit on the road! 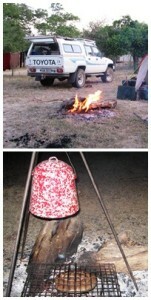 After dropping off the guards we located a camping spot in the compound of Kenya Wildlife Services. We just unpacked the necessary camping gear and then had to deal with a trickling cold shower and a toilet without water. Tired as hell we went to bed early! A first visit to Kenya was ticked off from the list! After this I have made several transfers at Jomo Kenyatta in Nairobi enroute to other wild and wonderful places on the globe. 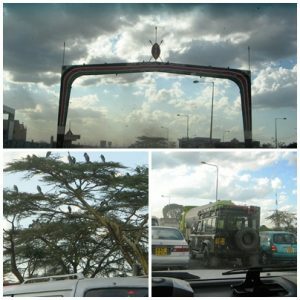 I will always remember my first Kenyan visit. CURRENCY NOTE: The Kenyan shilling is the local currency, but American Dollar is widely accepted especially in touristy places. At Jomo Kenyatta Airport they accept Euro, Dollar and Kenyan Shilling (KSH/KES) as payment method.